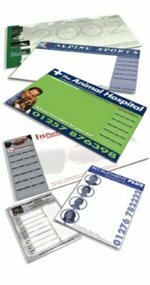 These are many different ways that you can promote your business details here at Calendar Lady Promotions and one of our more sucessful ways is advertising your details upon our Company Desk Pads. Just choose which sizes you prefer and we'll get them printed up with your company details and logo. So advertise your details upon our Company Desk Pads today..
Company Desk Pads Sizes - A2 large desk pad, A3 Large desk pads, A4 note pads, A5 note books and A6 mini note pads. To find out more about our Company Desk Pads click here and fill in the contact form and we'll be in touch. Other promotional and personalised items besides our Company Desk Pads click here to view our entire range.